Here at Pak Aerials, we supply, install and repair satellites all around the Devon area, these services include installing and repairing Sky satellite television systems. Sky digital TV is the number one choice for providing digital home entertainment to many homes throughout the UK, it's huge range of digital tv channels and interactive digital features offer an amazing service. Our specialist satellite installers are experts at their job, providing a hassle-free service with precision and experience. Our team can supply, install and repair satellites all across Devon. Devon Sky installation and maintenance services from Pak Aerials, include fixing any problems you may encounter with any part of your equipment. If you are experiencing a significant loss of reception signal, programme picture quality, or freezing images on your digital TV system through Sky, we will efficiently provide a service that is both professional and friendly, ensuring that your Sky satellite system is functioning correctly. Through using specialist high-tech equipment, we can make sure that your Sky satellite dish is in the correctly aligned position to receive the maximum strength in signal possible, not to mention making sure the satellite itself is in good working condition and fitted properly in the first place. Unsure if you have a problem with your Satellite? Simply contact us today and speak with our experienced professionals. 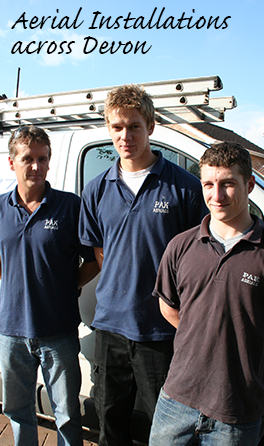 Our team are here to help with all aspects of satellite repair and installation, providing an expert service to all our customers.